A large new carnivorous dinosaur unearthed in Spain sported a very unusual pointed hump-like structure on its back, muscular legs and evidence for some of the world’s first feathers, according to a paper in the latest issue of the journal Nature. 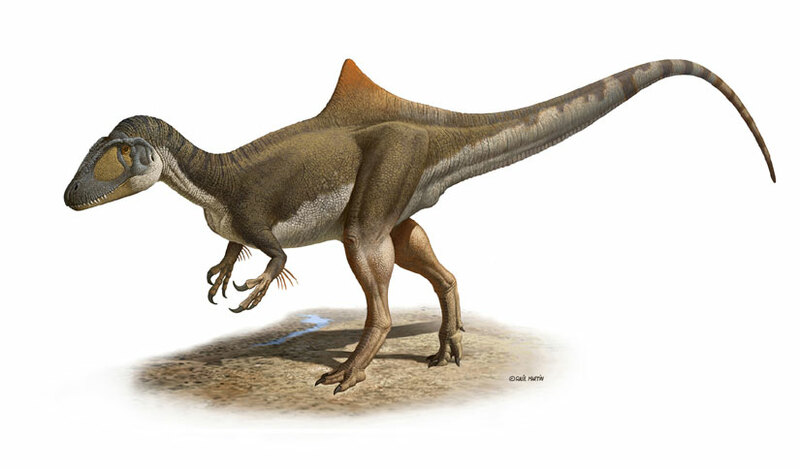 The dinosaur, Concavenator corcovatus, a.k.a. “the hunchbacked hunter from Cuenca,” lived 130 million years ago in what is now Cuenca, Spain. Close to 20 feet long, the dinosaur was related to Carcharodontosaurus, an enormous predatory dinosaur that was possibly even longer than Tyrannosaurus rex. The new dino’s “bizarre” hunchback look is a first for dinosaurs. “One of the unique characteristics of Concavenator, unknown in any other dinosaur yet discovered, is the particular elongation of the last two vertebrae in front of the hip area that project their neural spines on the back of the animal, forming a kind of hump whose function is so far unknown,” lead author Francisco Ortega told Discovery News. Like many modern birds, the dinosaur possessed “quill knobs,” or small bumps on the forearms that generally hold feathers. This likely means the large Spanish dinosaur either had feathers, or some type of skin structure that was “an ancestral stage of the feathers in birds,” according to Ortega. He and colleagues Fernando Escaso and Jose Sanz made the determinations after studying the dinosaur’s fossils, which represent the most complete carcharodontosaur and the first to show any evidence related to feathers. Scientists have been mulling over the original function of feathers for quite some time. A few theories were that feathers, or feather-like structures, helped with thermal control or aerodynamics, giving the animal lift and thrust. In this case, since the feathers appear to have just been on the dinosaur’s forearms, the evidence “points to a display function,” said Ortega, who added that they could have also served some as of yet unknown purpose too. With its pointy hump and possible feathers, the new dinosaur must have cut quite a figure in the wetlands of Early Cretaceous East-Central Spain, where it lived. It shared the area with other dinosaurs, birds, turtles, lizards, crocodiles, crustaceans and many other animals. At first, paleontologists thought that carcharodontosaurs were limited to the southern continents, since most such fossils were found in places like South America, Africa and Australia. But this latest discovery and some other recent finds indicate that the dinosaur group was well established in Europe and the northern continents — then Laurasia — too. C. corcovatus was a more primitive member of this group, however, since its body type differed from some of the more advanced forms, like the enormous Carcharodontosaurus. “This is a very important paper because it provides evidence that feathers were far more widespread among theropod dinosaurs — the predecessors of birds — than we previously thought,” Luis Chiappe, director of The Dinosaur Institute at the Natural History Museum of Los Angeles County, told Discovery News.